One of my favorite things about the holiday season is cranberries. We start seeing them in the stores in late October, and I stock up for all sorts of cooking fun. 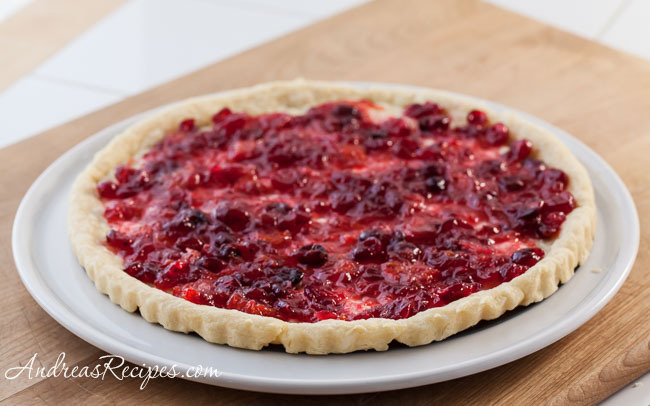 And those fresh cranberries are very tasty in this lovely cranberry tart, which is a riff on the traditional English fool—a dessert with fruit folded into a custard. 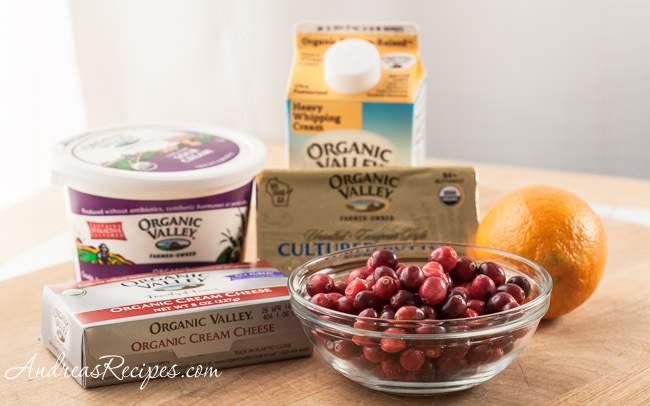 This version from the Organic Valley website folds cooked cranberries and oranges into whipped cream, which goes on top of a cream cheese tart crust with orange cranberry filling. 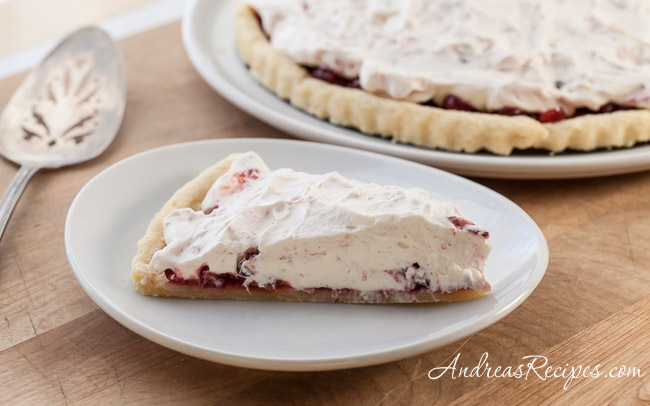 Make the tart crust with fresh butter, cream cheese, flour, and bit of salt. Then you cook the cranberry and orange filling and let it cool. 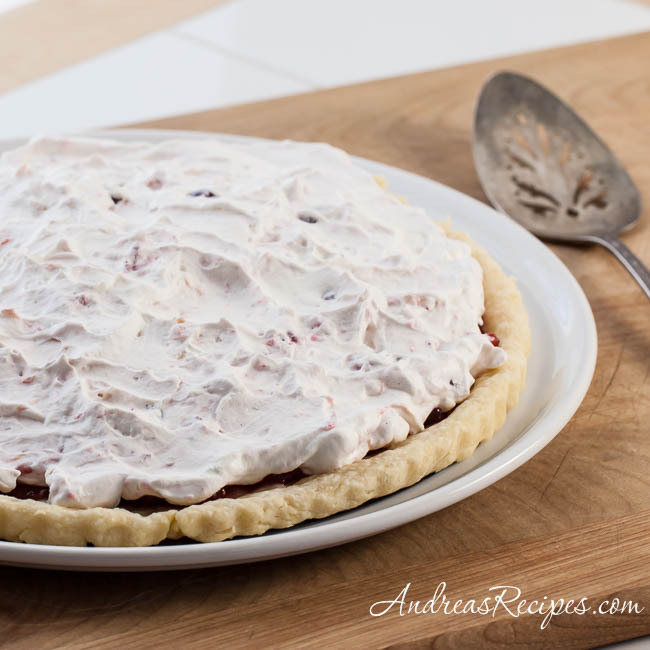 Spread about half of the orange cranberry filling on the tart, then fold the rest into a tangy whipped cream that’s made with heavy cream and sour cream. And spread the slightly pink cream all over the cranberry filling. Let it rest in the refrigerator for at least an hour, but not more than six hours, then it’s ready to serve for holiday parties or a pretty Christmas day dessert. And you’ll have plenty of volunteers to lick the bowl, spatula, and whisk. The original recipe calls for a stand mixer for making the dough, but I didn’t have such great luck with the cream cheese and butter mixing well in my mixer. Plus I’m partial to food processors for pie and tart dough, and that method worked best for me, so that’s how I wrote the recipe. Also, even though this is one of the easiest and silkiest doughs to handle, it needs some help to keep from turning into a puddle in the pan. Be gentle with it and don’t overwork it. Make sure it’s well frozen before you bake it. Since you will blind bake it—bake it empty—you’ll need to lay down a circle of parchment and fill it with beans to help it maintain its shape. Parts of the tart can be made ahead. You can bake the tart crust and make the cranberry filling the day before. On the day you intend to serve, spread half of the cranberry filling over the crust as in Step 6, and then proceed with the remaining steps. DOUGH – Add the flour and salt to the bowl of the food processor, and pulse a few times. Cut the cream cheese and unsalted butter into small pieces and add to the flour. Pulse about 12 to 15 times, until the mixture starts to clump together. Remove the dough from bowl and gently work it into a ball. Flatten the dough into a 1-1/2-inch thick disc. Wrap in plastic wrap and refrigerate at least 30 minutes. Remove the dough from refrigerator and place on a lightly floured surface. Roll dough to an 11-inch round (about 1/4-inch thickness). Place the dough in a 10-inch tart pan with removable bottom. Lightly press over bottom and up the edges of the pan. Prick dough all over with a fork. Freeze until solid, for several hours or overnight. Preheat the oven to 350° F/175° C. Lay the parchment circle in the bottom of the tart dough and fill it with beans. Bake the dough in the preheated oven until golden brown, about 16 to 18 minutes. Cool completely on wire rack. FILLING – Coarsely chop the orange meat and place in the medium saucepan with the zest, cranberries, sugar, salt, cinnamon and pepper. Cook over medium heat until cranberries pop, about 14 to 16 minutes. Remove from heat and allow to cool completely. Spread half of the mixture over the baked tart shell, and refrigerate. 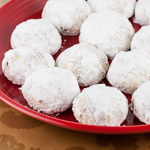 Combine the whipping cream, sour cream, and powdered sugar in bowl of the stand mixer. Using the balloon whisk attachment, whisk the mixture on high speed until soft peaks form. 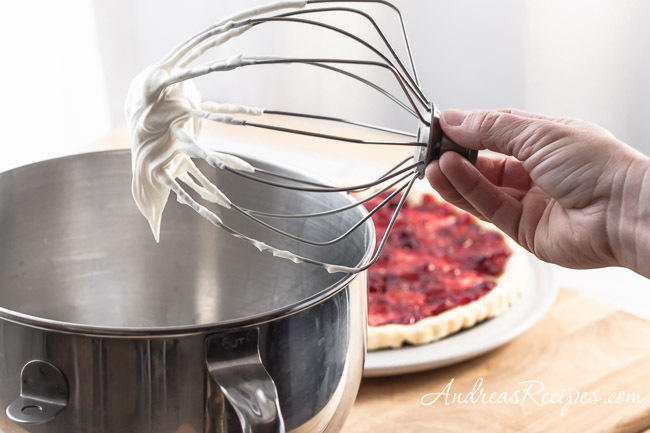 Use a spatula to lightly fold the remaining cranberry-orange mixture into the cream mixture just until streaks form, but not fully blended. Spread the mixture evenly over the tart. Refrigerate at least one hour but not more than 6 hours before serving. 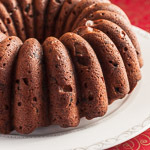 Thank you for linking up my bundt cake! Thanks Anna! I adore bundt cakes, and yours is beautiful. 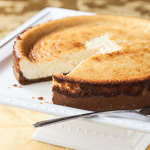 Thanks for checking out the cheesecake at Chez Chloe!… that’ almost a tongue twister. Impressive site and work you’ve got going on here- look forward to digging in some more.